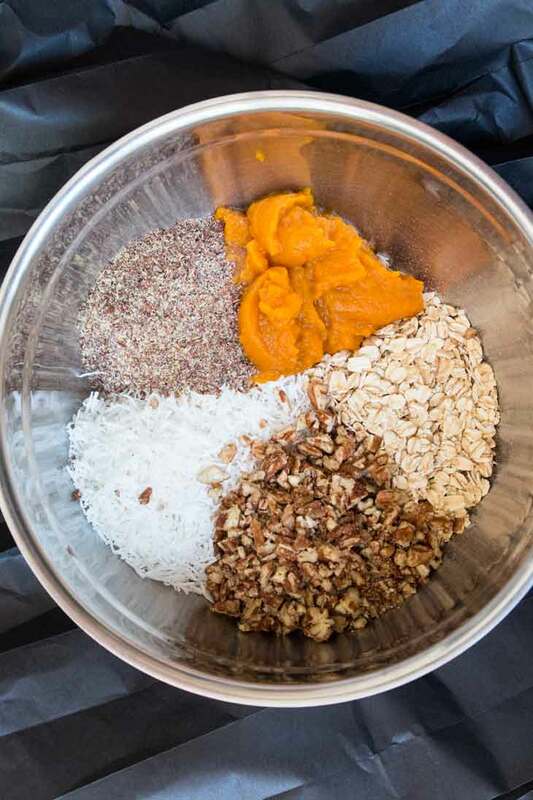 Get into the Fall spirit by devouring 3 (or 4) of these No-Bake Vegan Pumpkin Cookies with Pecans & Coconut! 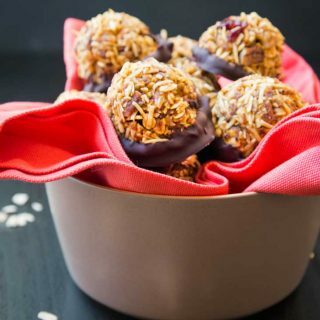 They take only 10 minutes to make, have minimal cleanup, are healthy, contain energy-boosting ingredients, and are the perfect guilt-free bites for breakfast, snack time, or dessert! Last year I sort of missed the mark on coming up with new pumpkin recipes. So to make it up to you guys I’m going all in this year, starting off with these No-Bake Vegan Pumpkin Cookies with Pecans & Coconut! I wasn’t planning on sharing this pumpkin cookie recipe until mid-October, but after sharing a sneak peak of them on Instagram last week, some of you couldn’t wait to get your hands on the recipe. Pumpkin is everywhere this time of year. Stores are showcasing all their new pumpkin products, brands are coming out with their new pumpkin line, pumpkin flavors are back in at coffee shops, and the shelves are stocked with rows of canned pumpkin puree. I personally love pumpkin everything, so I’m one of those that stocks up on cans of pumpkin puree with hopes of filling my kitchen with the smell of Fall. But along with pumpkins, Fall also brings around an extremely busy time of year. And before you know it, Fall is gone, Christmas has passed, and your kitchen pantry is still stocked with unused cans of pumpkin puree. And sure…you can enjoy pumpkin recipes all year, but let’s face it…it’s just not the same. So what’s the quickest way to fulfill that pumpkin craving we all get this time of year and fill your home with that perfect Fall treat? These no-bake vegan pumpkin cookies!! 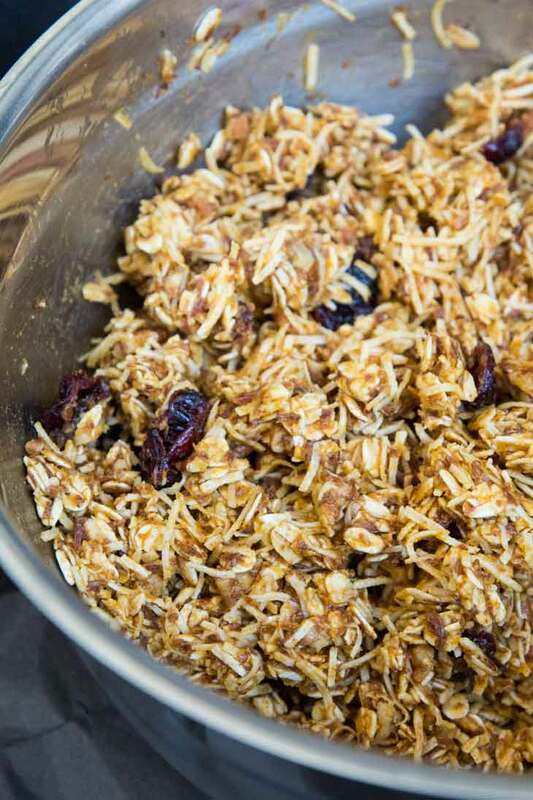 Oats , coconut, and flax seeds are the main ingredients in these no bake energy bites. To bring in that Fall flavor, I added pumpkin puree, pecans, cranberries, and warm spices. To keep cleanup minimal and avoid large kitchen appliances (such as a food processor), I used pure maple syrup as the sweetener. But you can just as easily substitute date paste if you prefer. Toss all the ingredients together in a mixing bowl, refrigerate, scoop and mold into balls, and store them in the fridge. There’s even an optional (but highly recommended) chocolate-dipping step for those of you who can’t resist adding in that chocolate! Hopefully by now I’ve convinced you that these vegan no-bake cookies are really quite fun and simple to make, and taste delicious! My kids can easily devour 3-4 of these pumpkin oatmeal cookies at a time. I’ve made 3 batches in my house and everyone’s already asking for more. So if there’s only one pumpkin recipe you have time to try this Fall, make it THIS one! And if you’re pantry is stocked with cans of pumpkin puree, then I have 3 more easy vegan pumpkin recipes coming your way! Get into the Fall spirit with these No-Bake Vegan Pumpkin Cookies! 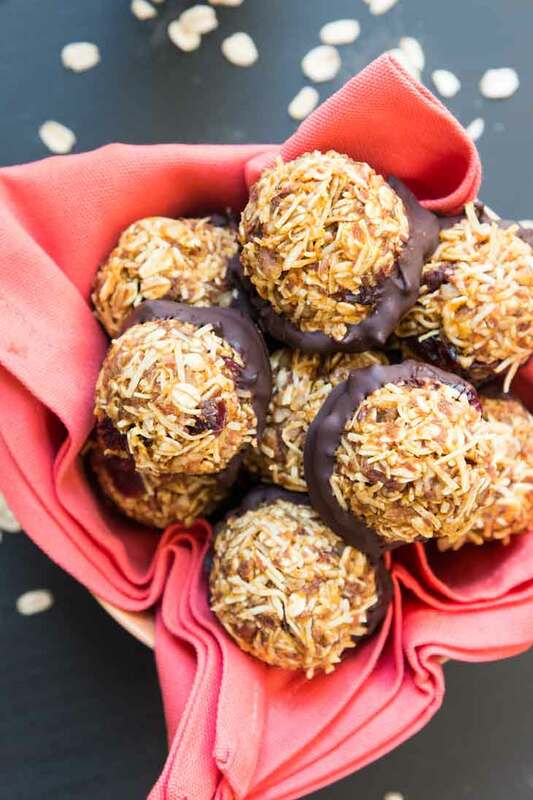 They take only 10 minutes to make, are mess-free and healthy, contain energy-boosting ingredients, and are the perfect guilt-free bites! Add all the ingredients listed under Cookies above in a large mixing bowl. Add more pumpkin spice if you prefer. Mix completely with a large spoon. Cover and place in fridge for 30 minutes to chill. Remove cookie mixture from fridge. Using a cookie scooper, scoop out semi-sphere shapes into the palm of your hand. Note that if you are not planning to dip in chocolate, feel free to roll each cookie into a ball-shape in the palm of your hands. Otherwise keep one side flat (semi-sphere). Lightly press around the cookie to make sure the shape holds and the mixture sticks together. 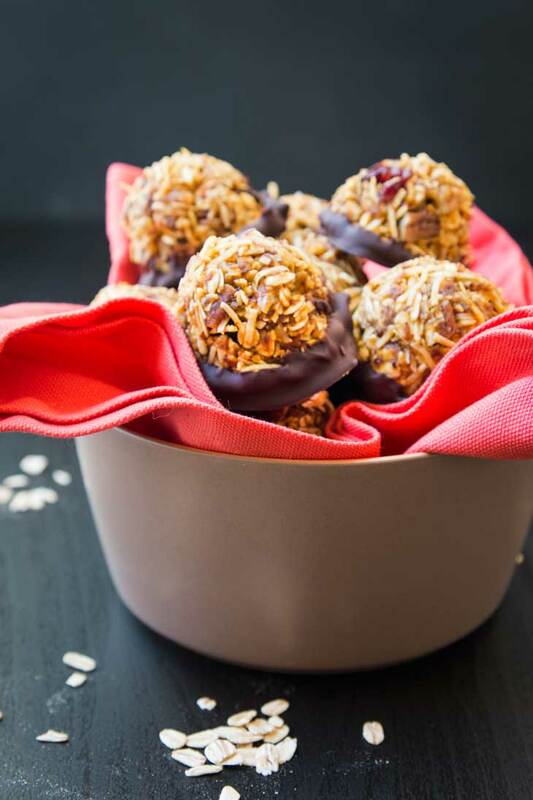 If you are not dipping in chocolate, place the no-bake cookie balls into an air-tight container and store in the fridge. If you are dipping in chocolate, place each formed semi-sphere cookie on the parchment paper. Place them in the fridge while you melt the chocolate. Using a double broiler method (or your method of choice), melt the chocolate completely until it's pour-able (be careful not to over melt or burn the chocolate). Dip the flat part of each cookie into the melted chocolate, catch any dripping chocolate, and place immediately back on the parchment paper (flat chocolate side down). Repeat with the remaining cookies, working fast, and place back in the fridge to allow the chocolate to harden. Store the finished cookies in an air-tight container in the fridge and enjoy! Nutrition Information below does not include the chocolate for dipping. These cookies taste great with or without the chocolate. I'd highly recommend the chocolate, but only a little dipped at the bottom like shown in the photographs (otherwise the chocolate flavor takes over). My preferred method for melting chocolate is the double broiler method. For gluten-free, be sure to specifically use gluten-free rolled oats. For the pecans, measure the quantity out after finely chopping. I used my hand blender + chopper/grinder attachment, and pulsed whole pecans until I got them down in size. These no bake cookies are the cutest thing ever :) I absolutely adore them, not to mention how amazingly delicious they look. Here in South Africa we do not get canned pumpkin puree at all. I have looked in many stores.. Such a pity because I would have loved to make these :) I can not wait for the upcoming pumpkin recipes! Thanks Reshana! That's such a bummer that you don't get canned pumpkin puree!! Anyway you can order easily for cheap online? Fall without pumpkin is not fun. That chocolate does perffect them haha! I knew you'd like that! I love anything no-bake, I'm not going to lie. These little cookies sound absolutely delicious! I'm pinning these to try, thanks! I know right?? Super easy throw together cookies...my favorite! You'll love them! Love healthy take on cookies. These look perfect for breakfast. thank you!! my kids LOVED getting them for breakfast...they called them "treats"! It's always good to have bite sized healthy treats around! They look delicious! Thanks sophia! They go so quickly that I've already made 4 batches! I love no bake goodies! These look delicious! This look amazing and I love how easy they are to make! These would make for the perfect road trip snack. Cookies for breakfast? Yes you can! I love bite sized healthful snacks! Thanks!! Oh totally cookies for breakfast! So cute and love a good no bake cookie! These look so delicious. Putting pumpkin and maple syrup together is a great combo for me. No bake desserts are the best because even non-bakers like me can make them! I love these flavors. Ha! You and me are pretty alike then! Love how quick and easy they are. Hi! 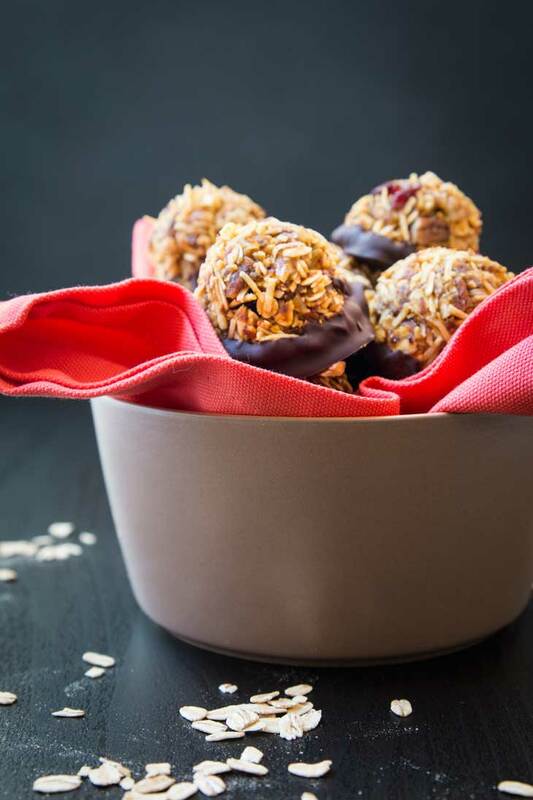 I love making no-bake energy balls & these sound perfect for fall (plus, I need to use the leftover pumpkin & coconut I opened earlier in the week for separate recipes)! I don't keep maple syrup on hand, so do you think honey would work the same? 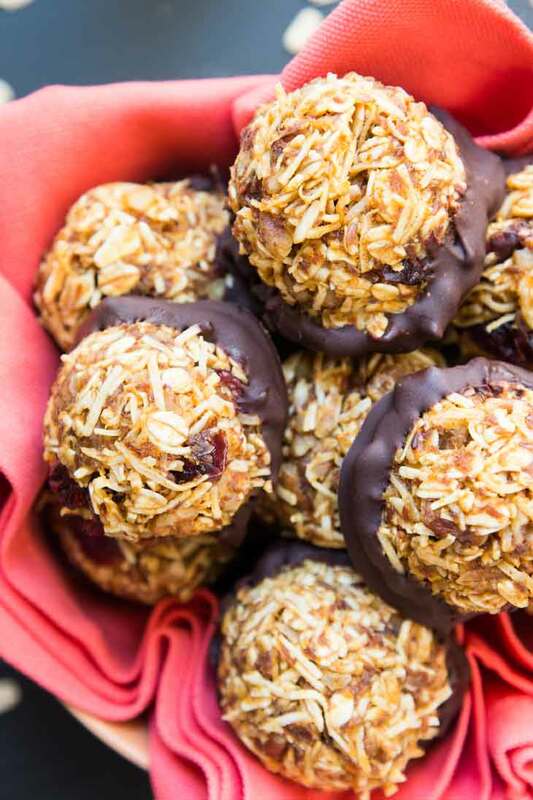 I want to make these for a Friendsgiving next weekend; perfect finger food :) Thanks!! Yes...agave syrup or honey should work just fine...the consistency of maple syrup is sometimes a little more runny, but it should work just fine! Let me know if you try it!